Wearing Water is a private log cabin at the end of the Gunflint Trail on Saganaga Lake. Located in the Boundary Waters Canoe Area Wilderness. Baldy's Nest is a modern cabin with a remote location near the end of the Gunflint Trail. At the edge of Minnesota's great wilderness, with direct access to the BWCA you will find Wearing Water. 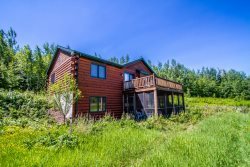 Located on the shores of Saganaga Lake at the end of the Gunflint Trail on Sag Lake Trail you will find this quaint log cabin and a wilderness experience unlike any other. This property is just two miles from the Canadian border. Wearing Water is a two bedroom plus loft, one bathroom log cabin that blends into the surrounding woods. However, it boasts all the amenities you would expect to find in a house in town. A luxurious base camp to return to after a day in the wilderness. Enjoy the gorgeous stone wood burning fireplace in the living room, Ducane gas grill on the lake facing deck, and plenty of wildlife that you can usually spot wandering through the property day and night. Drinking water is provided. Lake Saganaga, which is at the end of the Gunflint Trail 60 miles from Grand Marais, has a 25 horsepower limit. BWCA day permits for canoeing are stocked at the cabin, at nearby canoe outfitters, and at the public landing. You are right in the middle of the great Northern Minnesota Wilderness, but still have plenty of local amenities around in case you need them. The Voyageur Canoe Outfitters is a great stop to make for boat rentals, maps, advice, and supplies and is located about a quarter mile from Wearing Water. Dining options include the Gunflint Lodge and Trail Center back down the Gunflint Trail or the Trail's End Cafe if you go back onto the Gunflint Trail from Sag Lake Trail (turning right). The Chik-Wauk Museum and Nature Center makes for a great day trip to learn some of the history of the Gunflint Trail and to take a pleasant nature walk if you are looking for something to do during a day away from the boating. Whether you're looking for a base camp for a BWCA adventure or just looking for a peaceful escape from the hustle and bustle of real life and want to get away to somewhere very secluded, Wearing Water can offer it. Seasonal cabin, closed in the winter months. Easy and convenient booking process. Great cabin in wonderful location. The 2.5 bedroom cabin perfectly fits the needs for our family. We always look forward to going there which is in the middle of nowhere and we enjoy lots of peace and quiet. We want to be located on gorgeous Saganaga lake where we can enjoy hiking, berry picking, fishing, canoeing, boating, biking. Everyone was great to work with. Cabin was wonderful. Felt totally secluded with a great view of the water. Very enjoyable experience. Loved the deck, really appreciated the quiet. Delighted to discover that there were wild blueberries growing right outside the cabin door. The area has a special place in my heart. It was nice to be in the middle of nowhere and get away from it all. Really good value for the money. We were disappointed to discover that wash machine was out of order. It would have been nice to have been warned about it and that the nearest laundry mat is located at Gunflint Pines. The only thing that would have been nice to have in the kitchen was a rubber scraper. There was a mouse in the cabin. There were quite a few cobwebs. Loved the location and the home. Third time here, I obviously love it. It is always quiet neighbor wise. Granted it only matters to me at night or if it rains, but coming from someone who still doesn't have a flat screen TV, I like that amenity with the few movie channels. The location is perfect for me, I can do all I want to do, bike from the home, kayak/fish from the home, boat/fish from the home, thanks in part to Voyageurs Outfitters near by. That is a big perk! I like the fact that there are no properties across the bay from it, just nature.